The 23rd Annual Lexus of Richmond Leadership Award program had another excellent with year with 30 incredible, high school senior nominees! We hope you enjoyed getting to know these student-athlete scholarship nominees as we did this past school year. Our winner was chosen based on academic performance, athletic achievement, extra curricular activities and contributions to the community. 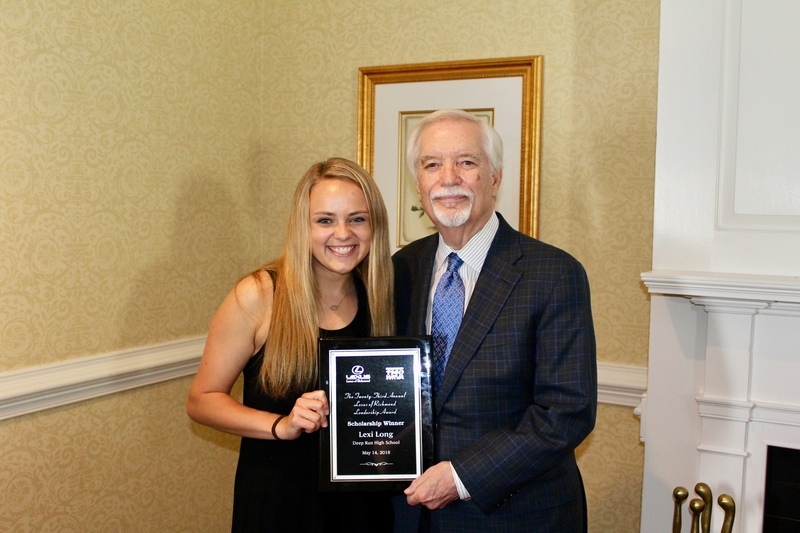 Lexi Long of Deep Run High School, Center for Information Technology Specialty School, was named the 23rd winner of our scholarship program on Monday, May 14, 2018. Lexi will be attending Stanford University in the fall to study computer science and engineering. While in high school Lexi was the President of the National Honor Society as well as a member of the Science National Honor Society, Computer Science Honor Society and Mu Alpha Theta. She was named an AP Scholar with Distinction, and Lexi scored a 35 out of 36 on the ACT test. For the SATs Lexi scored a 1510 out of 1600 having a perfect math score of 800. Having spent 4 years on the Varsity Soccer team, Lexi was selected as the captain for her senior season. In 2016 she was the leading goal scorer and won the most improved player award. She received accolades such as 1st Team All Conference, 1st Team All Region, and 2nd Team All State. Additionally she lettered two times for Varsity Gymnastics. Outside of athletics, Lexi was the Center for Information Technology Historian. She served as the Vice President for the Girls of the Center for Information Technology club. Lexi was the Student Council Association Class Historian. She was even selected for the Henrico County Student Congress representing Deep Run. Additionally Lexi was a member of Deep Run organizations such as: Beta Club, Key Club and the Programming Team. Giving back to the community plays a significant role in our scholarship, and Lexi is certainly no exception! Lexi spent time with the organization Caritas. She participated in a mission trip to Raleigh, North Carolina. Lexi was a member of the student organization SODA (Student Organization for Developing Attitudes). The SODA club is a group of high school students who mentor elementary children to help improve self esteem and assist with attitudes and social issues. She tutored fellow students at school in math and science, and she volunteered with various events put on at Deep Run and for the Center for Information Technology. We at Lexus of Richmond applaud Lexi for her academic achievement, athletic skill, commitment to extra curricular activities and time spent helping the community. We are pleased to present and support this outstanding young lady. We know Lexi will continue to excel as she moves forward and continues to experience amazing.